Suriname’s First Lady Ingrid Bouterse-Waldring says the Caribbean nation has been affected by climate change as it has experienced many destructive floods. 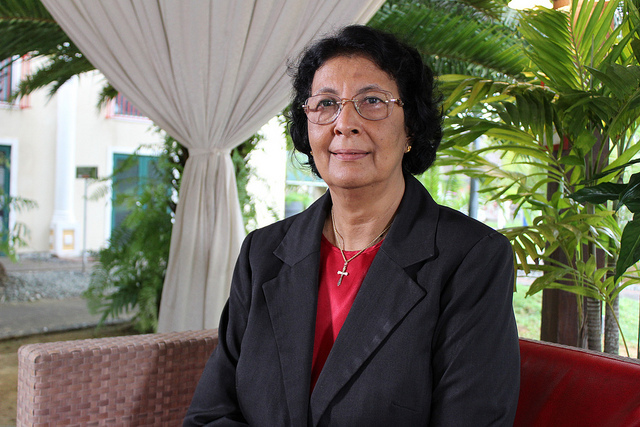 PARAMARIBO, Feb 21 2019 (IPS) – Two of the most prominent women in the Caribbean nation of Suriname are speaking out about developed countries that release large volumes of greenhouse gases into the atmosphere. First Lady Ingrid Bouterse-Waldring and Speaker of the National Assembly Jennifer Geerlings-Simons say Suriname and other countries in the region are feeling the brunt of the effects of climate change. “If we go to the interior of our country, then we see that we have had a lot of floods in those areas. These floods are destructive for the people who are living there. The effects are clearly noticeable especially to the women and the children,” Bouterse-Waldring told IPS. In the aftermath of Hurricanes Maria and Irma that devastated Antigua and Barbuda, Dominica, Puerto Rico, the Virgin Islands and others in 2017, many countries are still struggling to recover. The Speaker of Suriname’s National Assembly said that more than 1,000 homes lost their roofs in extreme weather conditions over the last 10 years. Previously, this sort of destruction to homes due to the weather was unheard of. “So, we’re feeling the effects right now,” she said. Geerlings-Simons said countries like Suriname, whose forests are actually aiding many other parts of the world, should get something in return. Not only do forests provide oxygen to the world, but according to the World Wide Fund For Nature two billion people either directly or indirectly rely on them for food, shelter and food security etc. “We have no way as poor countries or even a highly forested countries to defend ourselves against this onslaught of climate change which is already happening, and which is actually threatening our future in the relatively short term of a few decades,” Geerlings-Simons told IPS. Geerlings-Simons said this has already been tried and proven in Costa Rica. Twenty-two years ago, Costa Rica was the first in the world to start a nationwide scheme for compensating landowners for preserving their forests when it embarked on its national programme of payment for environmental services (PES). “If you pay someone to keep the forest standing, they will keep it standing because they don’t have to give it to someone to cut it down to get something to eat,” Geerlings-Simons said. “I am sure that if Europe, the United States or China would develop some kind of mechanism, some kind of machine, everybody would gladly be paying for it because it would strengthen their economy. “But now, finally after a few hundred years, some money has to come to this part of the world, at this moment where we are facing a very dire situation. The [International Panel on Climate Change] IPCC is not some kind of scaremongering organisation and they really gave us a stern warning. You do something, you get paid for it. Why is this an exception?” she added. Last year, the IPCC released a report assessing the impacts of global warming of 1.5 degrees C.
But as global emissions continue to rise, hopes of containing the planet’s warming well below 2 degrees C–the headline target of the Paris Agreement–are fading. “Why do we have to beg for money while delivering a service that put carbon into the air? The only way that some people will start reducing their carbon is when they have to pay. This is the way this world works,” Geerlings-Simons said. High Forest Cover and Low Deforestation (HFLD) nations hosted a major conference in Suriname earlier this month. The conference ended with the Krutu of Paramaribo Joint Declaration on HFLD Climate Mobilisation. Krutu—an indigenous Surinamese word—means a gathering of significance or a gathering of high dignitaries, resulting in something that is workable.